I can’t remember any year that I wore a mask for Halloween. They are hot, stuffy and smell weird. It’s makeup all the way for us. 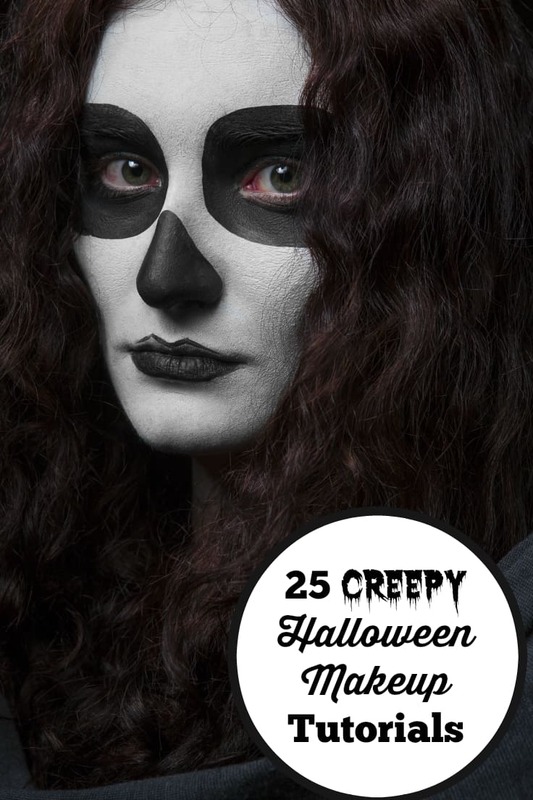 I love a good creepy costume with an equally Halloween makeup. Thank goodness for the Internet and its wealth of creepy Halloween makeup tutorials. Some of the ones I found are genius and truly scary. I’d freak out if one of these creatures showed up at my door! If you’re still not sure what your costume will be this year, check out these 25 creepy Halloween makeup tutorials. Some of them look so realistic that I had to look away! I think it would be fun to try a few to see if you can recreate the same effect at home. Getting creative with creepy Halloween makeup can be done with just a few supplies, most you probably have on hand already! I love the first face in black and white! Simple to do and SCARY! some of these are really creepy (headless woman for example) I did like the 1st one with black and white make-up but I’ve now read that it is in fact difficult to get right and it looked so simple. These are awesome! Thanks for sharing. I’m definitely using these. I love the creativity that people show. The tutorial on the fake burns and bruises was a good one! What a handy list – I think it might be too creepy for me! Never mind the 4 year old lol. Thanks for the wonderful make-up ideas! They’ll come in handy this Halloween! These are all very creepy, perfect for Halloween. My fave is Sally from the Nightmare Before Christmas. Thank you for sharing this post. Some of these are very creepy. I always make a mess of it when I try to do Halloween make-up, not talented in that at all!